Based on some ideas from other commenters, I decided to update a proposed restructure of Northgate Link related routes. As before, the map is focused on all-day routes in Northeast Seattle. 26 – The 26 has been altered considerably. It is faster, has fewer turns, provides all day coverage for 5th Avenue Northeast, and provides a better connection to Roosevelt Station. Only a handful will lose out, and their inconvenience will be minor. Overall, I think this change would result in more frequent, more direct service for more people. 40 – The 40 uses First Avenue so that it can get to Northgate faster. This change has been considered by Metro for a while. I dig into the details with regards to buses in the U-District this time. There are tough trade-offs here, but I tried to focus on a few themes. First is that consolidation is a good thing, but can be too much of a good thing. Without adequate improvements (e. g. off-board payment and bus lanes) it can lead to bus bunching. Certain streets also make sense as through streets, while others don’t. Finally, there is the new Link station to consider. Given all that, I want to see the buses running on Brooklyn and University Way (“The Ave”). I was temped to run all the buses on Brooklyn, but north of 45th, that is problematic (requiring twists and turns to get there). Likewise, running all buses on The Ave would likely lead to congestion. Moving the 49 over to Brooklyn works out really well. It would have fewer turns than it has now. Moving the 31/32 to Brooklyn is similar. The 74 also would use Brooklyn, and be paired with either a 31 or 32. The other 31/32 would just end north of Brooklyn. Other buses are consolidated on University Way. This means that it would be very easy to take a bus to the south end of campus (towards the medical center). There may be too many buses on The Ave, but if that is a problem, then the 271 and 48 could be moved to Brooklyn. I would rather avoid that, because the 45 (which also serves south campus) can’t easily use Brooklyn. The map is dynamic. There are variations you can choose to get a good idea of the trade-offs. For each selection, you need to deselect the corresponding other variation(s) to create a meaningful network. For example, you can select one of three options for the 522, but selecting more than one (or none) would make for a silly map. In all cases, my preferred variation is the first one. 45/62 — The 45 and 62 provide east-west coverage in the area. I’ve since come around to the idea that the best approach is the current one (Variation One). This breaks the grid, but matches demand better. There are a lot of people along the 85th/Green Lake corridor, and giving them both a connection to Link as well as a one seat ride to the UW makes sense. Variation 2 provides for a better grid, but it doesn’t add too many trip connections. The main advantage are for folks in the less traveled parts of Sand Point Way headed to 85th (e. g. Matthews Beach). Even then, this route simply speeds up the process (either way it can be a two seat ride). 65 — With the 65, the choice is mostly between speed versus coverage. I also prefer doubling up service on 65th, given the clusters of apartments around 25th and 35th. 522 — The variations on 522 involve getting from Lake City Way to the Roosevelt Station. The third option is straightforward, but likely to get bogged down during rush hour. The first variation should be significantly faster, but would likely require adding a left turn signal on 20th (here). There already is a left turn lane, so this would be a minor change. Ideally the bus would turn on 15th, but there is no room for a left turn lane there. I don’t like to split up routes, but it isn’t clear in this case that it would matter, as there would not necessarily be any stops between 15th and 20th. The second variation uses 20th, which would be more straightforward, and allow for a bit more coverage (on 20th). However, it would mean losing the stop at 15th and Lake City Way (which is a lot more important). There are a fair number of shops on that corner, whereas that part of 20th and 75th has very little. A faster Link connection on 35th ave is reasonable if workable. Redundancy on 65th is too much to waste I think. And there is a little bit of redundancy on 35th with the 66 as well. So I’d keep the 65 variation 2, get rid of the 45 east of Roosevelt station, and change the 66 to go east on 65 and replace the 45 (up to NOAA), and put savings to frequency across the board. That way everyone is as close as reasonably possible to a Link transfer, with decent coverage with frequent routes. Terminate the 522 at Roosevelt station if we detour off of 522/I-5, since if we do a Link connection then there really isn’t much point to the express portion after that. The 372 should be terminated at 145th with well-timed transfers from route 522. Most riders will want 522 anyway. That’ll save a ton of hours which could also be put into frequency. Nice idea with the 74 replacing the 78. I’d keep that but with a bigger loop in Laurelhurst, not as big as the old 25 loop, but significantly bigger. Or just terminate farther south if it’s not live loopable. Laurelhurst triangle looks like a decent bus place for a bus turnaround that will take a few more minutes to get to, but isn’t crazy like the 25 was, and still gives people who live there a reason to take transit. Finally, truncating the south 26 at U-district station seems pretty obvious. It will leave a couple holes in places that are less than a quarter mile from frequent transit, which would cost basically a bus route from the U-district station to downtown to serve if the 62 is kept to the south. What service would there be on Lake City Way, Ravenna Avenue and 25th Ave NE if you terminate the 372 at 145th. I catch the 372 on Ravenna Ave to connect to the Light Rail at UW and I am not the only one as there are a lot of riders on that street and 25th Ave NE. Metro already screwed us when they cancelled the 72 and now you are proposing to cancel all bus service along that route. I suggested truncating off the north part, not the south part. The truncated 372 would run from UW station to NE 145th street. The thinking is that far north, there will be the 522 to Roosevelt station, which will get you to both downtown and UW with a Link transfer, or transfer to the 372 at 145th if you normally just take the 372 from farther up north. More comments on your ideas (hopefully these show up in the right place). Yeah, I was planning on terminating the 522 at Roosevelt (I figured that was clear from the map, but I can understand why it wouldn’t be). ST has made clear that they will not send the 522 downtown, and have considered Roosevelt as a termination point (Northgate is the other choice). I don’t where exactly to end the bus in Laurelhurst, or how much of an area to cover. For 522, it might be helpful to think about the long term relationship between the STX 522 and 522 BRT. If STX522 is to be replaced by the STRIDE route, then it should probably truncate at Northgate, but if you expect STX522 to continue to operate in addition to STRIDE, truncating at Roosevelt probably makes more sense. Sound Transit has made it clear they want to send the 522 to either Roosevelt or Northgate once Northgate Link gets here. The 522 BRT will go to 145th. I think the 522 BRT will replace the Sound Transit 522 bus, which means that it will be up to Metro to provide service along Lake City Way. I expect them to do that, but that is the subject for another post. Metro told the residents up there the 312 would be expanded to all-day. If that holds then 522 Stride would be a frequent east-west service that connects to Link, and the 312 will be a half-hourly alternative to downtown (replacing the 522). Metro also plans to upgrade the 372 to RapidRide, although its Metro Connects map doesn’t seem to take Stride into account so maybe it’s pre-Stride and it will ultimately be truncated at 145th. Or if Stride is limited-stop, then the 372 may be the local shadow. This will be a shock to Northside residents. Many are up in arms that when 522BRT opens, they will lose their 1 seat ride to downtown. And it seems they may lose their 1 seat ride a few years before BRT opens. Metro’s been silent at ST open houses, but what I’ve gathered is that the 312 might go away with the 522 and there’d be more limited rush hour service to downtown on a bus like the 309 (2515 in Metro Connects). The current plan for 522 BRT is to make most of the stops the 522 makes now in Lake Forest Park, Kenmore, and Bothell. So a shadow 372 isn’t strictly needed. But Metro’s long range plan upgrades the full 372 to Rapid Ride level through Bothell, not just through Lake City. If the 372 is truncated at 130th, then there’s a service gap for anyone travelling north from Fred Meyer. If the 372 is truncated at 145th, there’s no obvious layover. So it makes sense to keep the 372 going at least to the Lake Forest Park town center if not Kenmore P&R. If the 372 is truncated at 130th [after 522 BRT] then there’s a service gap for anyone travelling north from Fred Meyer. If the 372 is truncated at 145th, there’s no obvious layover. So it makes sense to keep the 372 going at least to the Lake Forest Park town center if not Kenmore P&R. I don’t think the 372 will be truncated at 130th. Like you said, that would create a service gap. I think 522 BRT moves the tail of a lot of buses farther north (up to at least 145th). The 372 would go as far as 145th. I also think a Bitter Lake to Lake City bus would go as far as 145th as well (otherwise it would be a two seat ride for folks in between 125th and 145th). There is no obvious layover, but I suggest a few ideas down below which wouldn’t be too hard. It wouldn’t be shocking to see the 372 go all the way to Bothell, but I think that would be overkill. It would add very little value in my opinion. It would be weird to tell folks along Bothell Way that they need to take a two seat ride to get downtown, but they can have a one seat ride to the UW. The longer the trip, the more that transfer make sense, and north of 145th, you are still a long ways away from the UW. In other words, it is quite reasonable to take a (BRT) bus from Lake Forest Park to the station at 145th, followed by a quick train to the UW. Likewise, a two seat ride from Lake City to Bothell is a bit irritating, but quite reasonable, given the distances involved. Shifting all of those rides to the 522 BRT means that it will be busy, and can have good frequency all day. Since it is BRT (or something close to it) the buses will be fairly reliable, and thus the wait time will be minimal. I would rather have consistent 8 minute headways all day, versus a 10 minute bus mixed in with a 15 minute bus. For what it’s worth, I’m planning on writing a proposal for a bus restructure following Lynnwood Link (and 522 BRT). A lot of these ideas will be discussed again (I wanted to hash out the Northgate ideas before writing that). There will always be something from the northshore suburbs to Link if the 522 is deleted but Stride hasn’t started yet. That’s a primary transit commitment ST has acknowledged going all the way back to the beginning of ST Express. Lake City is in a different situation because it’s not a primary transit market for the 522, it’s just on the way, and North King is paying nothing for it. It ultimately goes back to the fact that the 522 replaced the 307, and the 307 was like a combined 41+522 serving Northgate and Lake City on its way to Bothell (hourly). So Metro will have to pick up the ball for Lake City. There is a weekend version of the 372 that does something similar to what you suggested. It ends where the 41 ends. How often the bus ends there or ends further up the road is something I didn’t want to get into. Ideally it would go up to 145th every time, but the same is true of the 41. I think once Link gets to 145th (and the 522 BRT goes on 145th) we will see buses truncated up there. I have some ideas for the restructure following that, but haven’t finished it yet. That’s pretty much it. If they go with a fast connection to Link (which the 372 is not since the Link connection is far away, and the 522 presently isn’t), then the duplicate service north of NE 145th should just become double frequent connection to Link. It would be even faster if the new route 522 takes over the 41 tail completely, with maybe another route connecting Roosevelt to Lake City. It is pretty clear that there will be a new set of changes when SR 522 BRT opens, but that’s in 2024. The three years in between is a significant amount of time that NE Seattle will be living with the interim plan. But since 522 BRT will run on NE 145th, that’s all the more reason to terminate the 372 on NE 145th since that will set up a service pattern that matches future expectations. I agree. It would make sense for Metro to figure out how to layover north of (or close to) 145th. This would be used by the 372 in the short run, and other buses in the long run. By “other buses”, I mean a bus that goes from Lake City to Bitter Lake (and possibly beyond). That bus — the one that connects to NE 130th — would be very frequent, since it would not only connect two urban areas to Link, but to each other as well as the transit network (the E, the 5, etc.). Laying over north of 145th is not obvious. I can think of three possibilities. First is to go to Lake Forest Park. There is a left turn light (https://goo.gl/maps/vvALgoFhGX42), which means it would be pretty simple to turn and layover in the mall. The big advantage to doing this is that same direction transfers occur between 145th and Lake Forest Park, when both buses are going the same direction, using adjacent or identical stops. That way, a rider doesn’t have to cross the street to keep going on Lake City/Bothell Way. Sound Transit has already said they would add a stop on 153rd, making that a good transfer point. The mall is not a great terminus, but it is something. I could see it developing as well. You also have a connection to buses on Ballinger Way. The only drawback to going that far is that it is additional distance. But it isn’t that far, and if ST adds additional bus lanes, it would be fairly quick. There are some apartments along the way (as well as the Ballinger bus) so some folks would appreciate the overlap. Other options would likely require crossing the street, but make for better efficiency, as the buses don’t overlap as much. I can think of a couple different routes around 145th. This way looks pretty simple: https://goo.gl/maps/nhGA4H3WLkt. You take a left on 145th, then a right onto 32nd and park. When you start up your route again, you just merge here, where there is a bus lane: https://goo.gl/maps/mQQtunvmTjw. Connecting trips in a southbound direction would only need a Metro stop along Lake City Way (even if the BRT stop is around the corner). In a northbound direction, you would reuse the existing bus stop along 145th (https://goo.gl/maps/RVt1SYByHXr) for the Metro buses. You would still have to cross 145th, though. The other drawback is that you have a pretty big gap in the northbound direction, right before the end of the run (which is the worse time for a gap). The last bus stop in a northbound direction would be at 137th. That leads to some long walks, but nothing terrible, in my opinion. Another option is this: https://goo.gl/maps/doost8DQsTS2. You would need to add a left turn arrow for 143rd, as well as converting the middle lane to favor northbound to westbound. This has similar issues as the last idea (you have to cross the street, but in the opposite direction). Of all the options, I think I like Lake Forest Park the best. It makes for the smoothest same direction travel. There are a lot of people who are used to one stop rides from one part of SR 522 to another. I have no problem telling them that they have to transfer, but making that transfer easy is worth it, in my opinion. I like a 44 that goes in a straight line, but will the missing trolley wire east of 15th make it a nonstarter? The route for the 44 comes out of the RapidRide+ plans (http://seattletransitblog.com/2015/12/21/rapidride-the-corridors/). Yes, it would likely involve running wire. You have a lot of ideas, so I’ll comment on them one by one. I see the 26 as an infrequent bus. I wouldn’t exactly call it a coverage bus, but it is similar. There are other ways to get there. A few of the alternatives will be a bit slower, but not horrible. For example, I could take the 26 to Wallingford from downtown, or I could use Link and transfer to the 31/32. The point being, if we want to truncate the 26 at the UW, we might as well get rid of all of it. If anything, service along Latona/Thackery is the strongest part. There is decent density along that corridor (due to older “missing middle” type housing that was grandfathered in — https://jeffreylinn.carto.com/viz/681ff218-0a5d-11e6-8f50-0ea31932ec1d/embed_map). If the 26 goes to the U-District, then it creates a coverage hole, and makes some trips a lot more cumbersome. More than anything, though, truncation doesn’t really save you a lot, or get you much. If you are headed to the U-District, then you take the more frequent 44 or 31/32 (depending on where you are). In terms of service, it would be shorter to get to the U-District, but not that much faster. The route I describe is fairly fast. There aren’t a lot of turns. I think the bus can be justified, with 15 minute frequency. If not — if Metro thinks it can only run every half hour — then I would kill it altogether, as I don’t see any particular segment being a better value than any other. That was supposed to be a reply to Alex. I’m having trouble with comments at the moment. OK, as far as the big change, I think what you have in mind is basically this: https://drive.google.com/open?id=1OfSJXYfcB8EerjyP89DfKYFGv9hj8Dme&usp=sharing. I think that would work, and there would be some savings. Specifically, I think you remove this much redundant service: https://goo.gl/maps/dCbYQ8a9UVk. Fair enough. But that service is not that expensive. It doesn’t take that long to serve those areas. If you put those savings into the new 65, I think you are looking at running it every 13 minutes instead of 15. There are also clusters of apartments along the way. On a rider per minute basis, the redundant service you are removing is actually a pretty good value. The people in those apartments would likely go from having 7.5 minute service, to 13 minute service. So the folks in the apartments get worse service, but folks along the rest of the new 65 (which is largely low density) get a more frequent bus. (People in the Lake City area will take other buses). Of course you can put the service into other, more productive routes. But that just means the people in the apartments (along that corridor) are in worse shape (service goes from 7.5 minutes to 15). The point is, that little snippet (the redundant part) is actually relatively dense, whereas the other parts aren’t. Sand Point — Lose a one seat ride to Roosevelt. This is also a much faster way to get to Link. You save somewhere around 5 to 10 minutes by going to Roosevelt Station (much of that is by avoiding the extra walking). It takes a lot longer to get to Greenwood or the north part of Green Lake. It is still a two seat ride, of course, but you are much further south (you have to go through the UW to get to Greenwood). Similarly, there are minor two seat destinations that also become a lot more difficult. Any of the areas on the north-south buses (67, 522, 372) take a lot longer. These are relatively minor destinations (e. g. https://goo.gl/maps/hY5ovcMgD6L2) but they add up. You do gain some redundant service to Children’s and the UW, but only by taking a fairly back and forth route that takes an extra five minutes or so before it follows the 75. Greenwood — Lose their one seat right to the UW. Part of the reason I prefer Variation 1 is because the demand from Greenwood is much higher than that along 65th. But the other reason is that I think that corridor should have a one seat right to the UW. I realize the two seat ride could be fast (via Link) or frequent (via the buses) but there aren’t going to be that many buses, especially if the 45 truncates there. If Link runs every ten minutes during the day, or someone is headed in between the two stops serving the UW, then there is just the Roosevelt RapidRide and the new 67. That would mean an additional 5 to 10 minutes for that trip as well. View Ridge — Basically they have a bigger service hole. It isn’t too far to walk to 65th, but for many, the other route avoids that. Wedgwood — They lose their one seat ride to the UW. Maybe they don’t deserve all that, but it is just another loss. https://drive.google.com/open?id=1F0Ml8ZqHx4QxcvDeqzIiQ_fu-VTQR8lL&usp=sharing. This is pretty clean, with very little redundancy. It also keeps things fairly similar to what they are now. You do have some of the drawbacks I mentioned, but not that many (e. g. Greenwood and Sand Point point are fine). I probably should have come up with that as an option, since it does save a lot of service hours. I think a lot of this comes down to service hours. I assume that every bus on here runs every 15 minutes or better. That includes the 66, which will have trouble justifying that kind of service. If Metro can’t, then it makes more sense to run a leaner option, like that one. I de-emphasize the UW station. The UW station is really bad from a bus integration standpoint. From certain corridors it is barely acceptable. But from the northeast, it is terrible. From the northeast, you have to go to campus, which adds quite a bit of time to the journey. I also de-emphasize the Northgate Transit Center, since it takes a long time to get there. That is why, from that area, I send the buses to Roosevelt. Not only is it a readily accessible Link station, but it is also is a major connection point for a lot of buses. The new map has two very different variations of the 65 and 66. The two go together (you want to match the first 66 to the first 65, etc.). But I also think either version of the 66 is optional. If you leave out a 66, then you have a small coverage hole. The bigger problem is more of a connection hole. For some trips, you can get there, but it takes a while. As with all the variations, I prefer the first option. I see more people from the 65th corridor headed to Roosevelt (for the reasons mentioned above) than the UW. Without the 66, however, folks along the corridor go from having a frequent one seat ride to the UW, to a very cumbersome two seat ride. So I would have the 66 (to the UW) but probably not run it as often (every 15 minutes instead of 10). Variation 2 is more like what we have now. It works, but it means sending a lot of buses to the UW. Again, I would keep the 66 (to Roosevelt). I would probably run the 65 a little less often, but run that 66 more often (meaning more frequent service to Roosevelt). Hopefully all of that makes sense. Yeah, I leave a lot of suggestions. My imagination runs wild with these things. Thanks for taking the time to go over them in detail :-). I’ll break these up into many comments as well so that they can be individually responded to. It’s pretty clear that the UW Station is the worst station for connecting buses to, except right now it’s the best, because it’s the only station north of the ship canal. Once Northgate opens, UW Station will be the best station only for SR 520 routes, the 48 and (peak-only and deadhead) 43, riders on Pacific who happen to be closer to UW Station than U-District Station, and that’s it. One interesting side effect of only having UW station is that a grid system works primarily in the north-south direction (e.g., the 67, 372, 65, and a bunch more go directly to UW Station and provide large coverage of NE Seattle), with the caveat that the north/south legs of the grid converge at the south end, which the geography of NE Seattle supports nicely. It’s kind of a long haul if you’re up north, and (with the exception of the 71 and 44) if you’re on a horizontal line but not close to a vertical line, you don’t really have a good option to connect to Link. You can walk far to get to a bus to get to a train to get downtown, or you can take the 62 and a nap. It’s worse if you’re only close to the 74 unless you work peak hours. It’s either a 3-seat ride with Link or a 2-seat ride with the 70. With Northgate Link, it’s flipped, so the grid favors east/west connections to Link rather than north/south, with Link having stations distributed at almost every east/west bus corridor. My imagination runs wild with these things. Yeah, you and me both. I agree with all of your points. At first glance, much of the existing system looks great for Northgate Link. Just truncate the 41 and 522, extend the 44 to Children’s, add more service for the key routes, and that’s it. You have a pretty good grid (or at least as good as you are going to get for that part of town). It is only when you consider the connections to the stations themselves that things get complicated. UW station is bad, and Northgate is almost as bad. Clearly, Roosevelt is the best from various directions (until the NE 130th and NE 145th stations are added). That pushed me towards sending more buses towards Roosevelt, including the 65. This breaks the grid, but I think it would be popular. Otherwise, folks along 35th (away from 65th) get nothing out of Northgate Link. I can’t seen anyone making a transfer to get to the Roosevelt station (you would lose the five or ten minutes you would otherwise save). More than anything, I really have trouble running the 65 every ten minutes, when most of the people would rather use Roosevelt station (to ride Link or connect to other buses). That is kind of why I like the second 65/66 variation. Keep the 65 as it, but reduce it’s frequency a bit (to maybe 12 or 15 minutes). Put that extra service into a new, short route that turns the corner. That is not that different than a truncated 71 or 76, except with less twists and turns. Speaking of which, I really don’t like the tail or the 71 and 76. There are no apartments or shops on 65th between 35th and Sand Point, so that detour gets you nothing. Folks from farther north (75th and 85th) — where there are apartments — have to endure a detour. That is why I didn’t detour over there very much, as I think simply truncating the 71 and 76 would not be that good. It would mean people at, say, 75th and 35th, would either live with the slow connection they have now (at UW station) or endure a pretty time consuming loop that picks up very few people. If anything, I would loop around in reverse order, so that the coverage part of the route is at the end (https://goo.gl/maps/ASQBCD823jF2). That way you have just as much coverage, but the people in the apartments are served first. That is another idea I now wish I had incorporated in the original map (and blog post). I have added it to the latest version. It is definitely weird, but if you understand the reasoning behind the tail, it actually makes sense. The route is actually simpler, as the layover space is simply where there was one way service anyway (along 50th or 55th, take your pick). You reuse all the old bus stops, meaning you have just as much coverage. It is just that the coverage takes place after you’ve served the apartments. With all these changes, I may have to make a third post. Ideally, I’d prefer not to have that coverage loop to begin with. The original way, as you said, imposes a coverage detour on riders on 35th to pick up almost no one. However, I’m not convinced the coverage loop is really going to save time for people who live there over alternative options, such as walking to either 35th (to catch the same bus after the loop) or 65th (to catch the 62 to Roosevelt Station). If Dembowski insists on it being there, I suppose the reverse loop is the way to do it, so it at least only consumes operations money, rather than the time of other riders. The new loop would likely be a little bit faster — require a little less operations time — than the existing loop. It would also be a good test. If it turns out only a handful of people use the tail, then it would make sense to remove it. Right now you don’t have that, because the bus does things along its route that other buses don’t. The 76 is an express to downtown, while the 71 is a one seat ride to the U-District. Worth noting is that these sorts of tails are not necessarily that expensive. In this case, it doubles as a layover point. I think it only adds about five minutes each way. Right, it was never intended to be a transfer station beyond the routes that naturally go there:, those from 520, 23rd, and Pacific Street. Northeast Seattle routes should go to U-District Station instead. 520 and 23rd routes can serve both stations, so that it’s not a 3-seat ride from U Village to the Eastside or Madison Valley. The way it was done, it doesn’t look like it was even intended to be a transfer station for 520 routes even. I see your point about redundancy. I haven’t done any of the service hours math, so I don’t know how many service hours will be saved with reducing a redundancy, I just know that some will be. Coverage vs frequency vs. redundancy are obviously still trade-offs. My guess though (which may certainly be wrong) is that, while removing certain redundancies may result in small savings, all of them taken together (e.g., the truncated 26, plus the truncated 372, plus the non-redundant 66, and maybe some more if we can find them) could push more and more routes into 10 minute frequency, which is a magic number with Link in particular, and work nicely for bus-to-bus connections as well. If it won’t quite work, then I think we don’t need to be afraid of 20-minute headways. Certain coverage-ish routes like the 26 or the off-peak 74 (which didn’t even exist after the U-link restructure) can still connect to Link, and is more consistent of a transfer experience than 15 minute headways. 15 minute headways that connect to 10-minute Link can in fact be very annoying, and I think a 10-minute core, 20 minute coverage grid is preferable to a 15-minute everything grid, especially with the prevalence of apps like OneBusAway that can help you time your departure to a specific bus. Me neither. In the previous version (https://seattletransitblog.com/2017/03/12/north-seattle-bus-routes-after-northgate-link/) I did take a stab at it. I agree, though. I think it makes way more sense to have some buses be 20 minute, while others are 10 minute, rather than all 15. I guess 20 minutes isn’t too bad, but I have trouble with any bus that is half hour. In rare cases, I suppose, when a route is coverage in nature, and expensive (and the alternative is basically a long walk) but much of the time I would rather walk a few blocks if it saves me a lot of time. But it is always going to be a judgement call. In general, I don’t mind overlapping routes as long as the overlap provides something new and a good value. 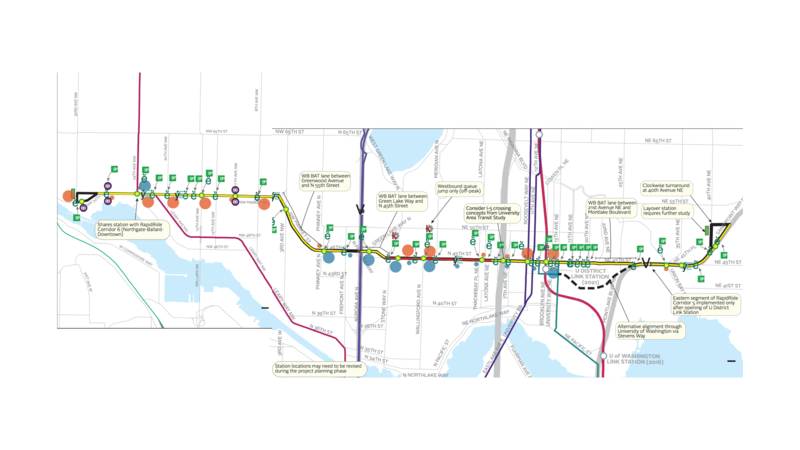 In the cases of the proposed 65 and 66, it is either a quicker connection to Link (via the Roosevelt station) or a route to the UW. Having both enhances the grid. Likewise, I don’t mind a coverage route as long as there isn’t a mismatch. I am not a fan of the 27, for example, because the tail is so weak, yet the core — service along Yesler — is so strong. That is a mismatch, and it means that either folks get way more service than they can use (on the eastern end) or Yesler gets way more than they need. In such cases, I like what they did with the eastern part of the 3. Not every 3 goes to Madrona (some do, some don’t). This makes sense for very frequent core routes with a weak tail. But for routes that are moderate with a weak tail — or worse yet, a weak middle — it is tougher. It is especially bad when covering that weak middle is very time consuming. In general, I don’t think I have much of a problem with that in this area. There are some routes that would not have much frequency. But they are pretty consistent or short. The new 74, new 66 (either version) are pretty short, fairly consistent and relatively weak. I see them as possible 20 minute candidates. The 26 is also fairly consistent. As I said before, I think the addition (to Northgate) is pretty strong on a ridership per minute basis, which means it might be able to run every 20 minutes as well. I see every other bus as being 15 minutes or better (a lot of them are already, and they would get stronger with Northgate Link and this sort of network). But what’s interesting is my attempt to reduce redundancy and connect everything to a close-ish Link station creates a very interesting “grid” system, except with stair-step shaped legs, not unlike east Kent’s bus system with the 168, 169, and 164). But with this system in its purest form, the average speed isn’t really faster, the travel time is just redistributed (the long-haul 372 rider will save significant time, but someone on the 62 around Sand Point who previously had a more or less straight shot to Roosevelt now has a more bendy ride to U-district. Actually I think it’s kind of funny that we ended up emulating Kent’s grid by accident. Buses inside UW on Stevens Way is something I didn’t even think about, but it is kinda redundant. One thing that can be done is that if we terminate a lot of buses at Roosevelt, then moving the 45 from UW Station to Stevens Way and terminating there is probably best, because then someone on a Roosevelt bus has the choice to Link to UDS or UWS (if any of those work best), or 45 to Stevens Way if they’d rather not walk so far to class. Having the 372 and the 75 AND the 66 all take the slow ride through the UW is kind of a lot though. And putting them on NE 45th would create much redundancy on 45 where there is amazingly no bus service today. It’s just really hard to do this without a lot of redundancy I guess. Right now, a lot of buses go on Pacific, from the U-District to the UW station. A big reason is to serve the only Link station north of the ship canal. When Link gets to the U-District (and beyond) I think it makes more sense to just go towards campus (on Stevens Way). I think that gets more people closer to their destination and is faster for the buses. It also has a side benefit, in that buses from the northeast (65, 75, 372) can be paired with it. The new 67 heads to campus (for that reason). I should probably send the 45 there as well (the main reason I kept it, was to simply call it “unchanged”). I could see sending one of the buses to the U-District (via 45th). It would mean that service would improve for some of those headed to Link (or just the U-District as a destination). Those headed to Children’s, the U-Village, and apartments near both of those areas would have extra buses running along 45th. There is a trade-off, though. One of the main ideas with this map is that from just about every apartment, you can get to Link or the UW campus very quickly. This breaks that approach. If the 75 keeps going on 45th up to the U-District, then folks from Sand Point can’t easily get to campus. In general they would be a lot less interested in this bus, since they already turned down a ride to Link (towards the Roosevelt station). The same is true for Lake City, and much of Lake City Way if the 372 heads there. That leaves the obvious candidate being the same 65/66 set of routes we have been struggling with. It doesn’t make sense for the new 66 on the map on this post. I think it only makes sense if we abandon that approach and just live with the fact that folks along 65th will have a two seat ride to Roosevelt (as they do know). Then you can just send the 65 to the U-District. It is a compromise of sorts. Ideally you have two bus routes (one to the UW campus, the other to Roosevelt Station). But this is significantly faster for Link riders, and still very good for those headed to the UW. Even if you would prefer a direct bus to campus, you would rather have the better frequency. (Besides, you can always transfer). I like that idea. That is a very interesting option. I have been reluctant to write another blog post, but based on your ideas, I think it makes a lot of sense. It will likely result in a complicated map, but it shouldn’t be too hard to follow. I will let this one sit for a while (hopefully more people will comment) and we can come to a closer consensus on these things, so that we don’t have a map with too many options. I tend to think that straight along 45th isn’t that far from “campus,” in that it’s very close to some buildings (assuming bus stops are placed every few blocks along 45th). It’s certainly better than walking from UW station or (depending on where you’re going) U-District station even. There could also be a middle ground, where inbound buses enter the campus through Pend Oreille Rd, but then turn right on E Stevens Way, right again on Memorial Way, then back to 45th, but this skips the fastest part of 45th (namely the viaduct, that saves waiting to cross the busy 25th Ave). I’d have the 45 go into the UW campus. There should be some service on NE Pacific Street, but not a whole lot. In the U-Link restructure, having lots of service on Pacific was important because Link did not extend to the U-district. Because of this, the “deal” Metro went with was that for cancelling the 71/72/73 expresses from downtown, they would provide a ridiculous amount of overlapping service on Pacific St, making it a 3rd Ave-like transit mall, where it’s never more than a couple of minutes to catch a bus to the light rail (in early proposals, this even included route 70). Now that there’s going to be a U-district station, that’s no longer as necessary, and (as we’ve seen) there is more of an urge to put lots of buses on 45th, both because it’s a fast way to get to U-district station and because it’s underserved today. One thing I just realized is that the 372 can’t really even get to 45th very well, since it’s an overpass. So that route is definitely going to stay on Pend Oreille/Stevens, unless we get good bus lanes on SB Montlake Blvd. So the question is which of the 66/75 on the fast path to U-District. I’d say either both or the 75 (because the 75 is longer, so those riders could most use the speed benefit). 75 — Sand Point riders can take the 62. People along 45th (Children’s and U-Village) will take the new 44. Lake City riders can take any number of buses (to Northgate or Roosevelt Stations). 65 — Those at 25th and 65th can ride the 62. People along 45th will take the 44 (as mentioned). 372 — Lake City riders, U-Village riders and those at 65th and 25th have other options (as mentioned). You not only have the problem you mentioned, but you also don’t gain much by doubling up service along 45th there. You double up service for U-Village, but leave out Children’s. So basically it is the in-between places that benefit. There really aren’t much on the 75 and 372, which means that the 65 is the only logical choice. Someone along 35th could use a faster way to get to Link, as well as the U-District. I will present this as an option in my next map, since it would mean you basically don’t need my new 66. All those riders just continue to take the 65, except that it gets to Link a bit faster, and the gets to the north end of campus. Now that there’s going to be a U-district station, that’s no longer as necessary, and (as we’ve seen) there is more of an urge to put lots of buses on 45th, both because it’s a fast way to get to U-district station and because it’s underserved today. Not sure if I follow you. Do you mean more buses running north-south, crossing 45th? Yes, definitely. But more buses running along 45th? I don’t see it. I mean I literally don’t see it on Metro’s long range map. As I’ve said before, the map is simply a set of ideas, but they figure that a RapidRide 44 can handle that load just fine — it doesn’t need a converging set of bus routes there (the way that north-south bus service will converge in the U-District). I happen to agree. The 75 gets stuck in Montlake Blvd traffic in the span between 30th and 25th. Between 5 and 6pm it sometimes takes 10-20 minutes to get from U Village to the first stop in campus. What I mean by a tendency to want to use 45th is that when you look at the big picture of the purpose of a Link restructure, it’s to connect people to Link as quickly as possible. In this case, clearly the worst to best Link stations are UW, Northgate, U-District, and Roosevelt, so naturally a bunch of buses currently routed to UW Station would be better served for the purpose of Link connections by going to U-District, before thinking through secondary priorities like giving people a bus straight to class. For current service, that means sending the 65, 75, and 78 to U-Dist on 45th, if your main concern is Link connectivity. For this reason, I’m starting to think that maybe it’s better for the 44 RapidRide to stay on its route to UWMC. This of course includes the bias of the current grid, so it would be fascinating to also start looking at how to restructure the pre-U-Link grid to Northgate Link, and what exactly changes. One big difference is that the main routes that U-Link replaced (71/72/73) were not “copies” of Link’s route, so we have a bunch of riders who get a well-serviced bus corridor, nearly all of whom will be need to take a train and transfer. Not so with Northgate Link, because the 41 it replaces is (except for intermediate stops and lower ridership tail) an exact copy of the 41, even down to the tunnel stations. The closest U-district route that Link comes close to replacing is the 67 to Northgate, which is mainly just made faster (though it’s not hard to get faster than the 67 to Northgate). You say that 372 riders along Lake City Way and Ravenna Ave have other options if that route is truncated at NE 145th as it comes from Bothell.. Unless I have missed it in the many posts on this threat what are the options. Lake City Way — Use the 522 to get to Roosevelt. 65th and 25th — Use the 62 to get to Roosevelt. 55th and 25th — Use the 74 to get to the U-District. 45th — Use the 44 to get to U-District. In the areas not mentioned, you are dependent on the 372. The thing is, not that many people live in those areas. There are very few apartments, other than ones mentioned in that list. Thus most of the riders along the 372 have an alternative to it. Furthermore, that alternative is faster for most riders. Using Roosevelt is much faster, and the first two groups of riders outnumber the last two. What I mean by a tendency to want to use 45th is that when you look at the big picture of the purpose of a Link restructure, it’s to connect people to Link as quickly as possible. I would consider that just one of the goals. It also makes sense to provide a better bus network. The two sometimes go together. One of the strongest arguments for the NE 130th station is that it enables a much better bus network. Riders will save a little time getting to Link, but they will save an enormous amount of time going east-west in the north end. It takes close to an hour on the bus to get from Lake City to Bitter Lake (https://goo.gl/maps/ZB4dyHfAuQu). This is without traffic. Driving it takes 10 minutes. Lake City and Bitter Lake are both high population centers for Seattle, and both likely to grow. Yet it takes an hour to make a ten minute trip between them! What is true of Lake City to Bitter Lake is true of Lake City to Greenwood, or anywhere on Aurora. Despite have very frequent and fast bus service along those corridors, transit is ridiculously bad connecting these areas. The restructure following the addition of the NE 130th station completely changes the dynamic for a lot of trips that don’t involve Link. But let’s assume that the primary goal is to connect a rider to Link. Now read my last comment (https://seattletransitblog.com/2019/04/06/north-seattle-bus-routes-after-northgate-link-updated/#comment-820749). Suddenly the 372 is a coverage bus. Why are you running that bus every 15 minutes, if the vast majority of riders have a better way to get to Link? What is true of that bus is true of the 75 and 65. Talk about redundancy. Why would someone at Sand Point or Lake City ride the 75 to get to the U-District Link station, when there is a far more direct, faster bus to Roosevelt? The short answer is they wouldn’t. Once Link gets to Northgate, the vast majority of people on that bus are headed to the UW. I would claim that the majority of those people are headed towards the middle of campus, where those buses currently go. Now it is possible that isn’t the case, and those riders would be just fine with the U-District. But if the vast majority prefer the current route (and I think that is the case) then it is worth preserving, because after Northgate Link, so few of those riders will use those buses as a means to get to Link. It is only when you get close to the U-District station (i. e. get on 45th) that taking a bus on 45th makes sense as a way to get to Link. But I really think that is a subset of the riders. I think way more riders (in places like Sand Point and Lake City) are interested in getting to the UW once they get on those buses. Furthermore, if someone is headed towards the north end of campus/U-District, then there are other ways to get there. If I’m in Lake City, and want to go the Neptune, I’m riding the bus to Roosevelt (or Northgate, if I miss it) and then riding Link. If I’m on 65th, I’m riding the 62, then transferring to Link, or just riding a bus towards the U-District. The primary beneficiaries of such a change would be those along 45th. They would lose frequency to the south end of campus (which includes the hospital, where there is a natural connection) and in return, get more frequency to the U-District. That is fine, but that is what I’m getting at it in terms of robbing Peter to pay Paul. Those that wanted to get to the south end of campus lose out, while those headed to the north end win. The vast majority of riders just trying to get to Link could care less. The 75 gets stuck in Montlake Blvd traffic in the span between 30th and 25th. Southbound, I assume. It would be nice to add a BAT lane in there, since it is such a short stretch. The cheapest way to achieve that would be to just take a lane. But that would likely cause traffic backups quite a ways up the road. That would in turn mean having to add BAT lanes quite a ways (at least up until 35th). But that would also benefit the 44, once it becomes RapidRide. I like that idea, especially since I’m guessing that the backup often extends well east of that point. The more expensive way to fix the situation would be to carve out a lane. That actually seems possible, if you moved the road in the opposite direction (northbound, right lane) to the east a bit. You might even be able to do so without taking any land from the UW (https://goo.gl/maps/iUch3jjRzYT2). Worth noting is the report for the RapidRide 44 (http://stb-wp.s3.amazonaws.com/wp-content/uploads/2015/12/17213958/BRT-Corridor-Maps.005.png) has BAT lanes for the viaduct. It doesn’t have BAT lanes for other parts of 45th. It also considers the idea of running through campus as an alternate route. That would mean that improvements would benefit all those buses in the area. For people who catch the 372 on Ravenna Ave and 25th Ave NE from NE 80th south the 522 is not convenient as it only stops at 20th Ave NE and Lake City Way and to get to that stop you have to walk up hill on Lake City Way starting at NE 92nd. South of there on Ravenna Ave most streets do not connect to Lake City Way. I brought up the same point when the 72 was cancelled that the 522 is not an option as it is not convenient. And your argument about riders on the 372 not connecting to the Light Rail at UW is a wrong assumption as that is the only way those riders can get to downtown. Yes they could connect to the 70 and 49 on Campus Way but that means meandering through either Capitol Hill or Eastlake Ave. With you proposal that means those riders who had a one seat ride on the 72 to downtown now must transfer to a much slower way to get to their destination. There are apartments and condo’s along Ravenna Ave and there are a lot of riders who catch the 372 on that street and also along 25th Ave NE. and they would not be with what you are proposing. With you proposal that means those riders who had a one seat ride on the 72 to downtown now must transfer to a much slower way to get to their destination. Huh? The 372 is unchanged. You can see that in the map. Those riders would continue to ride the 372 to the UW, then transfer to Link. And your argument about riders on the 372 not connecting to the Light Rail at UW is a wrong assumption as that is the only way those riders can get to downtown. It is now. In the future, *most* of those riders will have alternative ways of getting to Link. I never said *all* of them would, only *most*. Along the 372 route, almost all of the apartments have other options. You can see that from a zoning map: https://jeffreylinn.carto.com/viz/681ff218-0a5d-11e6-8f50-0ea31932ec1d/embed_map. You have a tiny zoned area at 75th and 25th. You have a grandfathered apartment building on 80th. You have a few scattered grandfathered duplexes here and there, and that is it. That is a tiny area compared to those parts of Lake City Way with apartments (and in the process of adding more). That being said, the 522 should add more stops along Lake City Way. The stop at 20th is one of the most popular stops on that route and that is before the new buildings go in. You have the new apartment going in across from the Growler guys, as well as the new housing development replacing the old mobile home park. You also have plenty of duplexes and small apartments going in that triangle area. But there should be stops between 20th and Lake City. It is a little tricky because of the lack of crosswalks as well as the fact that some streets don’t go through. I would add stops on 95th, 98th, 105th, 110th, 115th and 120th. Obviously 95th is too close to 98th (and too far away from 105th) but 100th doesn’t go through, and lacks a crosswalk. Other than that, though, you have pretty aggressive stop spacing. It would slow down the 522, but only marginally, while you pick up a lot of riders. As mentioned, I would also add a stop at 15th and 80th. The 45 has become one of the strongest routes so I’d lean toward keeping it. It is a grid route if you think of it as a northwest-southeast line rather than an L-shaped route. Just like Lake City needs an efficient way to get to Ballard (and transfer to Fremont), Greenwood/Loyal Heights need an efficient way to get to the U-District. The 45 goes all the way through the U-District so it serves all those trips, and UDist to Roosevelt and Greenlake, and Greenlake to Greenwood, etc. A corridor with lots of overlapping trips like Roosevelt-Eastlake (55th to 40th, 55th to Ronaoke, 45th to SLU). The Sand Point-Roosevelt connection is important. That was always a problem with the 71 and 30, and the 62 fixed it, and now it would be broken again. Sand Point is so far and isolated it needs a good east-west connection as well as north-south. At first glance, it looks bad. 345/346 to Northgate, then Link to Roosevelt, then 62 to Fremont. The 62 segment along is going to take about as long as it currently does to ride the slower 26 all the way. Thinking further, I don’t think it’s that bad. There will be a pedestrian bridge over I-5 to the Link Station, avoiding the 345/346 leg. And, you’ll have the option to consult OneBusAway to decide whether to get off at Roosevelt Station for the 62 or the U-District station for the 31/32. Yet another option would be to walk the other direction to Aurora and ride the E-line to 45th. This option has a significantly longer walk; but it avoids all transfers, and the one bus you need is a RapidRide. Taking a look at what you did with the 67, I kind of like it. Basically, it’s a statement that all those left turns through Northgate, the bus is going to get stuck in traffic, to the point where you may as well go to Roosevelt and you’ll get people from Pinehurst to a Link Station about as quickly. It also creates the justification for a 5th Ave. route, so that Maple Leaf still gets a bus connection to the actual Northgate Station. The only thing that bothers me a little bit is severing the connection between the North Seattle Community College neighborhood and Green Lake, particularly for those living a little west of the actual college. I suppose you can walk to the 45, but once you’ve done that, you’re close enough that you may as well just keep on going and walk all the way. I guess if you want an option that’s faster than walking, you can always hop on a Lime bike. The pedestrian bridge will be a major contribution to the neighborhood, as well as the bus network. For example “you’d get from the North Seattle Community College area to Fremont” by walking across the bridge and catching the 26. You could also walk across the bridge, catch Link to the U-District, and then get on the 31/32. You could take the 62, but I don’t think that will be as fast as the 31/32. The only bus I have swinging around the campus is the 345/346. I even considered sending that around (like the new 40) but I figure there should be at least one bus that is used for covering that section (for the people who don’t want to use the bridge). The 345/346 seem like the best choice, since you have to work your way over to Meridian anyway. It takes the same number of turns from the transit center either way and you cover some areas that I think are worth covering. It also makes sense to connect the various medical centers. Northwest Hospital is now part of UW Medicine, and has a clinic at 105th and Meridian along with the main hospital to the north; the UW has a clinic at Thornton Place, east of the transit center. Yeah, I really like the new 67 as well. It was the main reason I started doing this (I talk about it more with the previous post). I really don’t like the button hook, especially after Northgate Link gets here. This gets rid of the 73, and makes the system a lot faster. Good point. The more I think about, the more I feel like changing up the map again. I still don’t want to send the 26 to North Seattle College — there are just too many turns involved. But sending the 346 out there sounds reasonable. That means breaking the 345/346 pair, but I could live with that. The north part of Meridian (close to Haller Lake) is low density. If I keep the current 40 routing, then the frequent connection from College Way to Northgate is retained. If I don’t, then folks will use the bridge. I see. Maybe have either the 345 or 346 (pick one) continue south along Meridian to Green Lake, following what’s currently the path of the 26, then, perhaps cut over to Roosevelt Station and end the route there. I think that would work. The 345 is also a pretty strange route to begin with. It has way to many twists and turns, including two treks through parking lots in the middle of the route. Plus, the entire route, end to end, is redundant with other routes. For instance, if you were going from Northgate Transit Center to Shoreline Community College, would the one-seat ride on the 345 really be any faster than a transfer between the 40 and 5, where at least both pieces are following main roads and traveling in a straight line? Especially with your optimization of moving the 40 over to 1st, I would think not. Also, the 345 is runs only every 30 minutes at best, so chances are, if you’re waiting at Northgate, the 40 is going to come by first, anyway. Once 130th st. station opens, I feel a strong urge to kill the 345 in its entirety and replace it with a proper crosstown route. Maybe start at Shoreline Community College, head south to 130th, then east down 130th, all the way to Lake City. For the interim period where Link goes to Northgate, figuring out what to do gets harder. Maybe follow the basic form of the current route, but get rid of the unnecessary twists and turns? Perhaps, Greenwood->130th->Aurora->115th->Meridian, then continuing south to Green Lake and Roosevelt Station, as mentioned at the top of this comment. In general, having buses crawl through hospital feels like a waste of money and a waste of other passengers’ time. We’re talking a distance here of about 500 feet, with a good sidewalk and entirely flat. Anybody that can’t handle this walk is probably not going to be able to get to the bus stop on the other end, so they’re not going to be riding the bus, anyway. Maybe have either the 345 or 346 (pick one) continue south along Meridian to Green Lake, following what’s currently the path of the 26, then, perhaps cut over to Roosevelt Station and end the route there. Yeah, I have that as the latest (and hopefully last) proposal. It is pending approval, but should be in Page 2 fairly soon. I agree, the 345 is a messy route. I really didn’t want to delve into areas like that though, because they aren’t directly related to this change. For what it is worth, though, I treat the 345 as mostly a coverage route. In other words, its whole purpose is to cover areas like Ingraham (on 130th) and Northwest Hospital (via the little detour). I’m not saying I wouldn’t straighten it out, but I find more sympathy with the route than I do the parking lot tour made by the 50, just because the 50 does something no bus in the region does (connect West Seattle to Beacon Hill and Rainier Valley). In other words, I agree with you, the 345 is a bad way to get from Northgate TC to Shoreline CC, but that isn’t the point of the route. I am working on a post Lynnwood Link bus map. There is nothing that would resemble the 345. I do have some service on Meridian as well as crossing bus routes, but nothing that goes on Meridian and crosses (the buses get pulled towards Link Stations). Meridian Avenue also has 5-story office buildings north of the college. Yeah, there is either apartments or the college itself up to Northgate Way, and a couple blocks beyond. But after that, there is nothing until you get to the hospital. I’m not sure any of that justifies slowing down the 40 though. I think if you go around the other way, then you save quite a bit of time. You still want service along Meridian, and hopefully timed service. I’m just not sure you should loop around to Northgate as often as we currently do. The office buildings are between the college and Northgate Way. I used to work in one of them. Yeah, I should have said offices, campus and apartments. Or maybe density and destinations (which basically covers everything). Thanks, this will be a good reference when the Northgate Link restructure comes up. Thanks, Post is useful and informative. Keep up & continue good work. Once again thanks for sharing .